HAWAII ISLAND - In some areas, Olivia could bring significantly worse impacts than those brought by Lane, storm forecasters say. (BIVN) – Olivia has not weakened since it was downgraded to a Tropical Storm earlier this evening. As of 11 p.m., maximum sustained winds are still blowing near 70 mph with higher gusts. Gradual weakening is forecast during the next 48 hours, the Central Pacific Hurricane Center says, but Olivia is expected to remain a tropical storm as it moves over the Hawai‘ian islands. A Tropical Storm Warning remains in effect for Hawai‘i Island. A High Surf Warning is already in effect for east facing shores of the Big Island. A Flash Flood Watch is also in effect. On Monday, the Hawai‘i County Mayor Harry Kim signed an Emergency Proclamation for Olivia. Civil defense also said the county will not be distributing sandbags until active flooding occurs. “Please take the necessary precautions to prepare your property if you live in a flood prone area,” the county said. 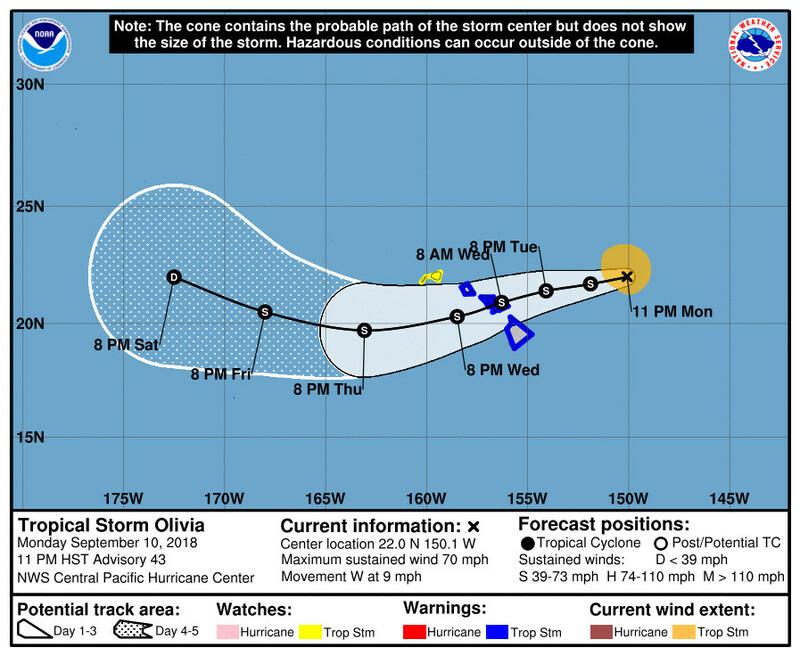 Due to the latest forecast of Tropical Storm Olivia, the Hawaii State Department of Education will resume afterschool activities on Hawaii Island tomorrow, Sept. 11. 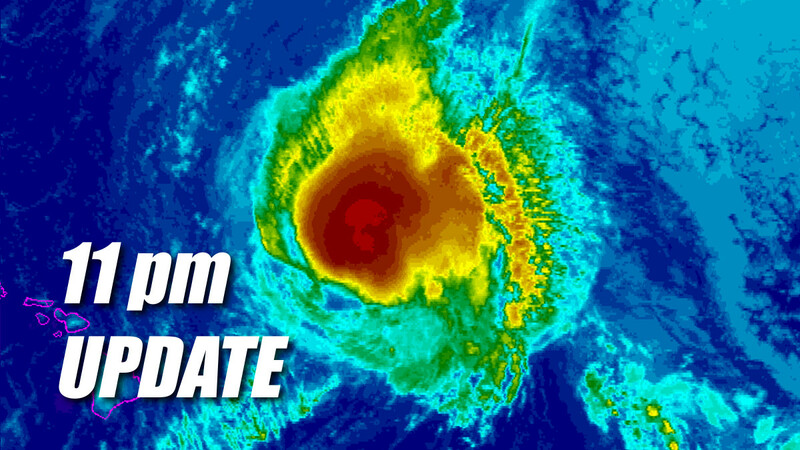 The DOE advises parents and guardians that public school schedules and afterschool programming may be modified across the islands this week as Hurricane Olivia approaches the state. Hurricane Hunters from the 53rd Weather Reconnaissance Squadron are again penetrating Olivia’s core this evening, and found the low- level center further east than anticipated. Some conflicting data exists as to the current intensity, as the central pressure has risen, but winds in the northwest quadrant were stronger than earlier today. A blend of the data supports maintaining the initial intensity at 60 kt for this advisory. The initial motion estimate for this advisory is 280/8 kt, with Olivia still being steered by a mid-level ridge centered to the distant northeast. Track guidance continues to indicate that a mid- level ridge building to the northwest of Olivia will induce a motion toward the west and west-southwest, with this expected to begin on Tuesday. At 72 hours and beyond, an upper level low is expected to develop between the ridge and Olivia, imparting a west-northwest motion on the tropical cyclone. The updated track forecast is shifted just slightly to the south of the previous, mostly after day 2, so the track forecast near the islands has changed little. Notable along-track differences between the GFS and ECMWF/HWRF exist, with the ECMWF/HWRF continuing to bring Olivia over the islands about 6-12 hours faster. The official forecast is on the north side of the guidance envelope, is close to the multi-model consensus TVCE, with the short-term forward speed a blend of the GFS and ECMWF/HWRF. Shear is expected to increase over the next 24 to 48 hours while SSTs increase to greater than 28C. The shear is expected to induce slow but steady weakening, and the updated intensity forecast is close to the previous and closely follows the multi-model intensity consensus IVCN. 1. Resist the temptation to make comparisons between Lane and Olivia. Although Lane was a stronger tropical cyclone near the islands, it did not bring direct core impacts to the state. In some areas, Olivia could bring significantly worse impacts than those brought by Lane. Those impacts could include intense flooding rainfall, damaging winds, and large and dangerous surf.